How do you teach your children to love who they are? I’m an observer and from the time I started going to school I began to see the children around me. The fact is, insecurities about oneself does not discriminate based socio-economic status, gender, ethnic backgrounds, nor geographic locations. Insecurities, start within the root of a person’s mind and reflects the person’s actions and speech. Having low self-esteem is a plague among young and old and can affect a person for a lifetime. Thus, how do we as parents began to foster a healthy self-image among our offspring. How do we train them to see the beauty they have on both the inside and the outside? We must love ourselves first, because they will learn to mimic they way we display love for them. Self love begins with us first. What do we say about ourselves when we look in the mirror. What words do we use to describe ourselves? How do we accept compliments from others? How do we accept our own flaws? Our children are watching us. We have to learn to love ourselves first because they are little reflections of who we are. If we are always complaining about our hair or eyes, our children will learn to dislike their hair and eyes. When we speak life into our own lives and compliment ourselves, our children will learn to do likewise. We must began to affirm them from birth. The way we look, hold, and hug our children matters. We will be their first teachers of love and acceptance. The way we cherish them is how they will learn to cherish themselves. Adore your children and fill them with hope and joy. Focus on their talents and providing them with praise by catching them doing good and recognizing it. Don’t harp on the negative, but be sure to address questionable and poor behaviors so they will learn right from wrong. Teaching our children has to be from a balanced approach. Constructive criticism will help refine their characters and guide their behavior in the future. We must encourage our children to love themselves based on their own perception and not how others view them. Unfortunately, everyone who connects with your children will not always see their value. But don’t fret, a little adversity in your child’s life will strengthen them. It is inevitable that your child will not always be liked, but that is life. People will surely mistreat your child at some point in his or her life, but just like you were able to cope and move on, so will your child. Thus it is important to teach your child not to place much weight on what others say about them. 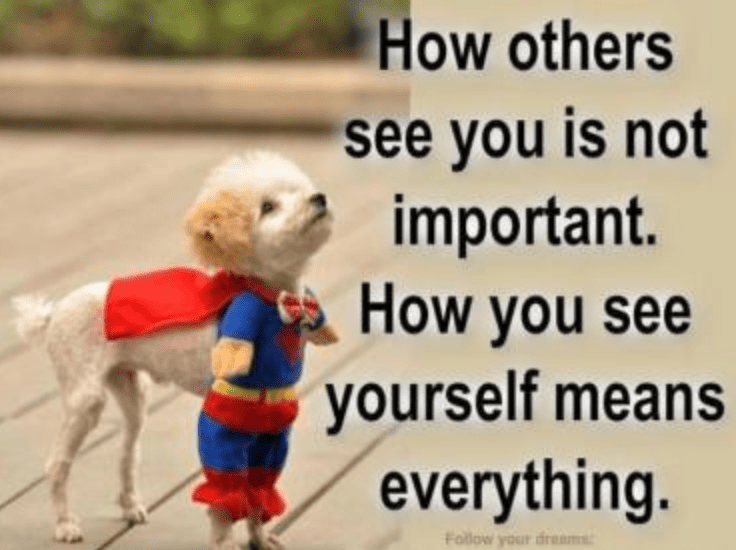 I learned early on that what matters most is how we view ourselves. When I see young children in show business, I feel sad for them a little. Sure, they will have money, but life is already hard and continually being in the public eye can mark them for life. The life and success of many celebrities are based on how the public sees them. Too much value is placed on whether the public still cares about them. Life is already difficult to handle, but it is even more difficult when you learn to place a monetary value on yourself in eyes of others. It is important to have a strong foundation and a strong sense of self-worth to make it through. People are fickle and sometimes it is hard for celebrities to separate their personal value from the value that Hollywood places on them, which is unhealthy. We must shower our children with words of affirmation and love continuously. Once you become a parent regardless of the logistics of it, it is important to be consistent with your love. In a two-parent home love has to be balanced among everyone in the home. Each person should learn to give to the family by supporting one another. In a single-parent home love has to be given to the child and yourself equally. The boyfriend or girlfriend comes next after your child. It is very difficult sometimes to balance this situation, but it is important for your child to understand that you will always be there for him or her no matter what. As a product of a single-parent home, I was able to succeed because I always knew that I was a top priority in my mom’s life regardless of anything else. Words that we speak to our children do matter, so we must speak words that will build them up and not tear down their self-worth. We are their first motivators. We are their first friends. We are their first advocates so through our actions they should learn what to accept and not accept based on their interactions with us. We are our children’s first instructors and the first lessons that we teach are nonverbal ones. The way we give affection to our children teaches them. Our actions should mirror the words we say and should be positive. Discipline is important but should be done in love. When our children are given to us, they arrive ready to be taught. Through the lessons we share with them they learn about life firsthand. It is important for us to remember that children will not always remember what we say but they will remember what we do and how we treat others. Our actions among our own spouse, friends, co-workers, and others are some of the lessons they are watching closely. Reader Response: How do you teach your children to love who they are? * Amazon Links on this blog are affiliate links.